Could you live like this? “Tinker's Bubble is an intentional community located near Yeovil in south Somerset, England. It was established in 1994 on forty acres of land consisting of about 20 acres of woodland as well as orchards and pasture.” (I quote from this page from Wikipedia and Economads, as they don’t have their own website.) “Low-impact living is the major idea of this community … For one, they have strict principals of not using fossil fuels.” So, how do they get by without petrol, diesel and gas? Apparently, they cook on a wood stove or over an open fire and use wind and solar energy for light. 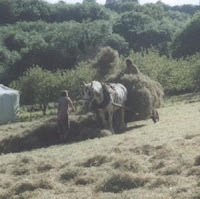 They cut hay using wonderfully light and sharp Austrian Scythes and sell timber which is felled by hand, logged by a Shire horse called Samson and then sawn up by a wood-fired steam-engine driven sawmill. Call me hypocritical but whilst one should use less fuel where possible, there are moments when I celebrate the power of the internal combustion engine. Neighbour Serge had a huge pile of stone that he was willing to donate to us for our impending straw-bale house build project. Pig-farming neighbour Paul has a huge, powerful John Deere tractor. He agreed to help me move the stones 50 yards / metres from Serge’s house to our building plot, a task that took myself, Paul, his tractor and Gabrielle’s brother Bruin (here to stay for a of couple of weeks) just over an hour. Difficult, this carbon debt stuff! On a lighter note, I was impressed and amused by the power of Paul's diesel-driven tractor to conveniently reposition these huge stones. Impressed by the raw, testosterone-charged, mechanical power, Bruin commented, "this tractor has balls", a statement we can now confirm. 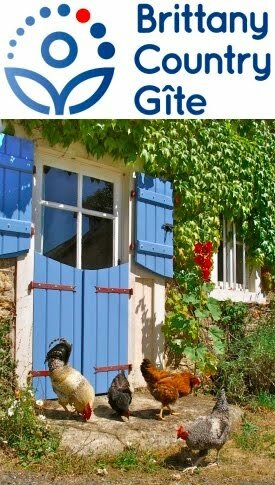 French nouns are divided into masculine and feminine—le orla, un orune, which is confusingly to do with how the word’s spelt, rather than bearing any relation to the meaning of the word, hence the “masculine” army and police are both “feminine”: une armée and la police. 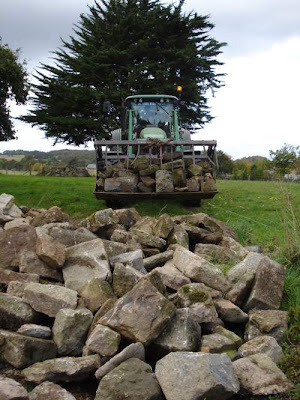 Seeing the brute force of the tractor shrugging off the challenge posed by these huge stones, how reassuring to find that it is “un tracteur”, i.e., unequivocally masculine. 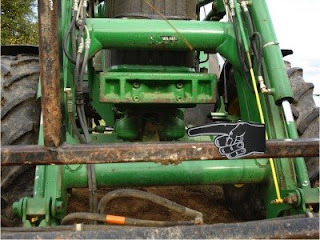 The proof: checkout these large pair of metal, tractor testicles and see if you agree. I would avoid driving a smaller, more feminine tractor during tractor mating season, if I were you... or I'd make sure the cabin has very strong safety hoops.